Originally at Dumfries, Scotland BENEDICTINE MONASTERY owed its beginnings to the initiative of Marcia, Lady Herries. 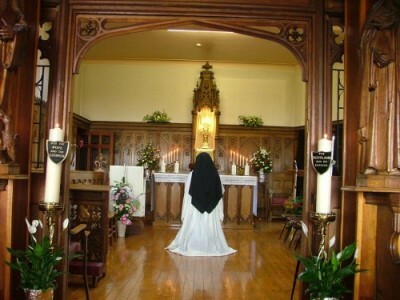 She built the Monastery at Dumfries and invited Benedictine Nuns from Arras, France to come to introduce Perpetual Adoration of the Blessed Sacrament in reparation for the dissolution of so many Monasteries in the Border Countries during the sixteenth century. In 1988 the Monastery moved to Largs on the west coast of Scotland. By Decree of the Holy See in 1992 the community was amalgamated with the Tyburn Nuns. The monastery has retreat facilities for individuals and groups. It also has a Christian Heritage Museum which is an exhibit of how Christianity and Monasticism came to the British Isles. There is also a tea room where refreshments are served to individuals and groups and there is also a shop where religious books, articles, sacramentals and handmade cards, crafts, various chaplets and rosary beads made by the sisters are sold. The sisters are in dire need of funds to repair their leaking roof, damaged ceilings and walls, and improve the heating by installing double glazed windows. Please enter the amount you wish to give in GBP, EUR or USD below, press 'Make a donation' and you will be taken through to our secure server hosted by Stripe. Your details will be taken by Stripe's online form. Thank you. May God bless you.